Can you believe Thanksgiving is just four days away? I am so excited to gather with my family and enjoy some delicious food. Since Thanksgiving is such a food orientated holiday I like the focus to be on the table. 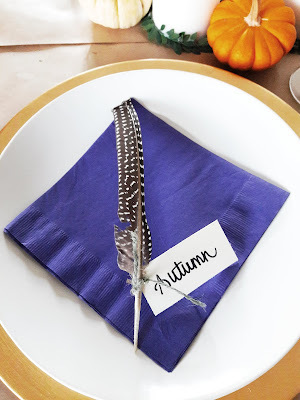 This year I created three fun place cards that can be made with things you probably already have on hand. I saw these place cards on Pinterest several years ago and fell in love. They are so easy to make and turn out beautiful! 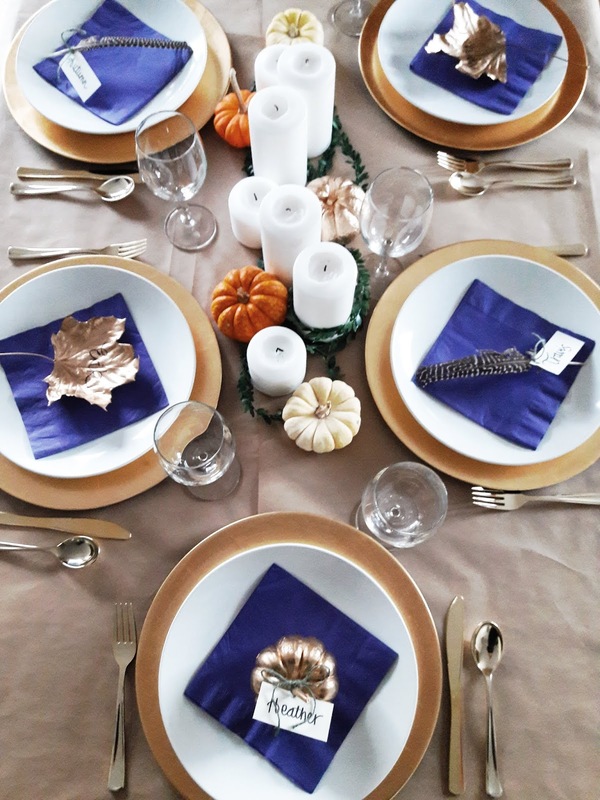 You can use silk leaves if you'd like something a little more sturdy or reusable. I used real leaves that I found down the street. 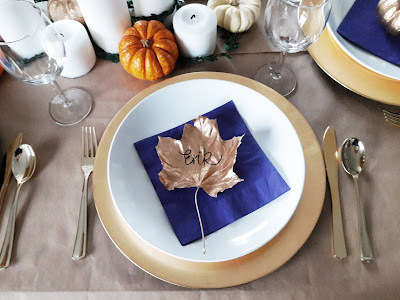 Simply spray paint the leaves gold. 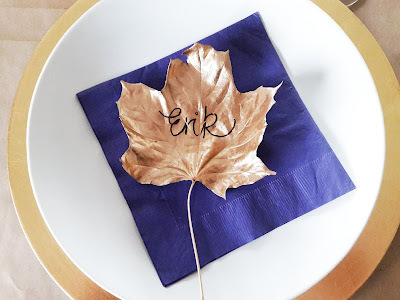 Using a marker write the name of your guest in the center of the leaf. Be careful not to apply too much pressure because the leaf will break. 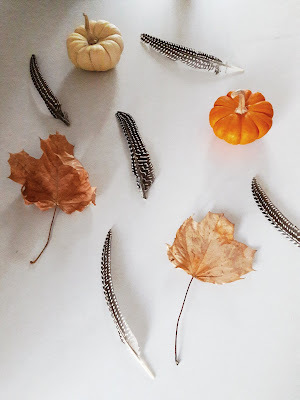 When trying to think of something else that was Thanksgiving themed other than pumpkins and leaves I thought of feathers. You know, like a turkey? I went on a hunt for some wild turkey feathers but wasn't able to find any that could be delivered in time. I wanted them to look natural so instead of using regular craft feathers I used these guinea feathers to get the brown and cream colors. Cut out a 3 inch X 1 inch card from the card stock. Write the name of your guest on the card. Cut a small hole in the top left corner of the place card. Feed the baker's twine through the hole. Tie the place card to the bottom of the feather with the baker's twine. This is an easy way to add some glam to a plain pumpkin. If you prefer the natural look or color of your pumpkins just add the place card. Lightly spray paint them gold. Cut a small hole in the top middle of the place card. 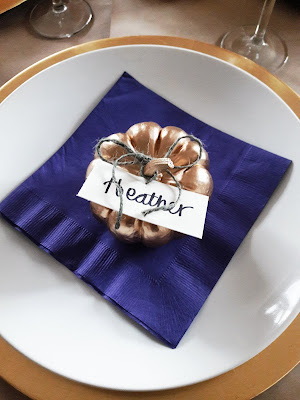 Tie the place card around the stem of the pumpkin. 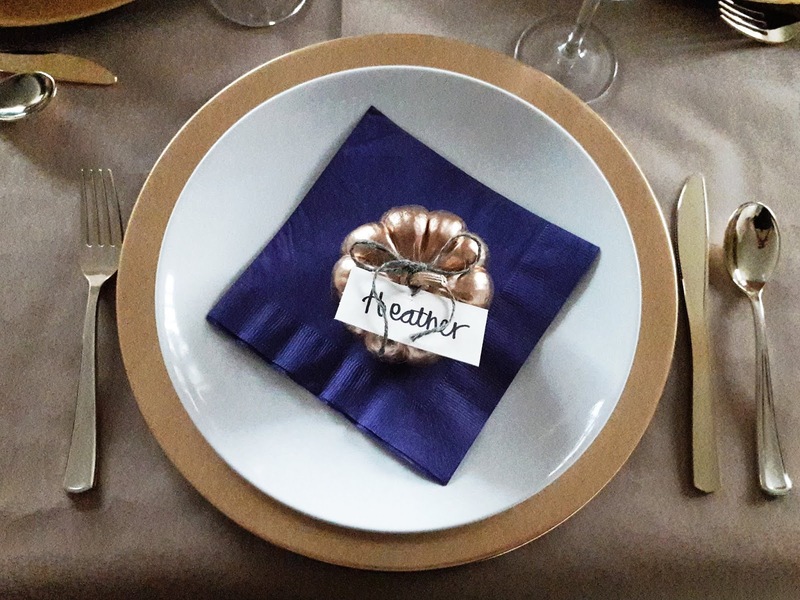 The place cards were so easy to make but add a lot of personality to the table. I am excited to see them on display during Thanksgiving dinner. 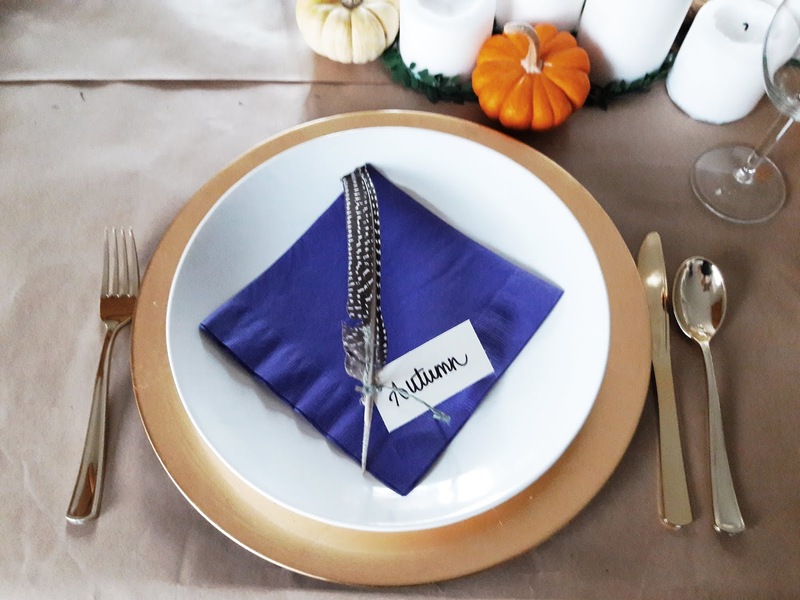 Who's coming to your Thanksgiving dinner?